Jam Entry: Existing Project, expanding and polishing features. Gameplay: It's an arcade shooter that would fall well into the "bullet hell" category. You control a ship that has various planting mechanisms (weapons) to spread life on the incoming asteroids and comets. You have to dodge your way through the obstacles. Successfully planting trees slows down fragments and subdues angry asteroids, but planted or not, you must avoid everything so navigate carefully. 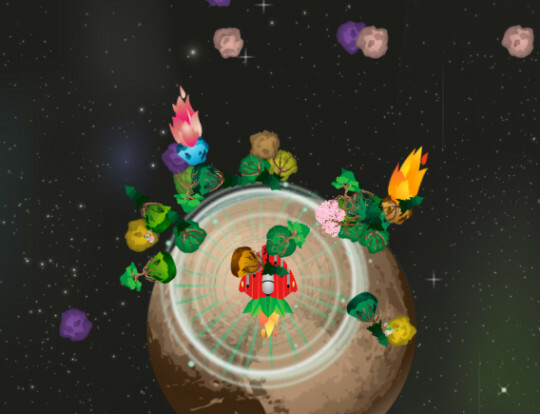 We started GalaxSeed a while back as part of the libgdx jam, and at the time we called it Planetary Planter. We had never participated in a month-long Jam before, and our end product was far less than complete. We procrastinated more than we worked on the game and it showed. Since the end of libgdx jam, we put in quite a bit more effort to create at least a full play cycle experience (Menu, Start Game, Play, Game Over, Repeat). During this time we really added features and generic systems to a sibling project: Kitten2d Ashley Extensions. All of the documentation needs to be updated, and plenty of performance and general code clean-up needs to be done, but between January and Mid-May we made a lot of progress to make this extension library useful for jumpstarting a libGDX-Ashley based project. We showed the game at an event in Louisville right as we had gotten the first draft ready to what we THOUGHT we were going to release. Based on feedback at the event, and that of other developers, we realized we really needed to re-think a lot of things. The game needed more variety, and needed to decide what it was going to be: Classic Shooter or full-on Bullet Hell? With Kentucky Fried Pixels right around the corner we decided to take Planetary Planter, and re-work the majority of the game and use this jam as the time-box to finish those changes. Above: Shot of the new pollen aura weapon. It slows down anything that is inside of the field, and slowly pollenates it to grow trees. Slowed items are indicated with a yellow shade while they are being pollenated. 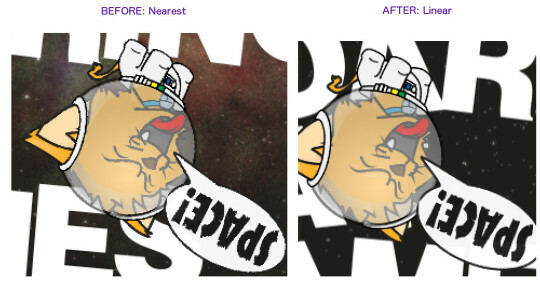 Above:Example of the difference between using Nearest and Linear openGL texture filters for our rotated textures. Right now in the post-jam version, you switch weapons every-time a "touchDown" event fires (mouse-click or tap). What we want to implement is when you lift your finger on mobile (or release mouse on desktop) the game "slows-down" and you get a weapon-pod system where you can select which weapon you wish to switch to. This will also be where we can pause the game.